I learned something yesterday. 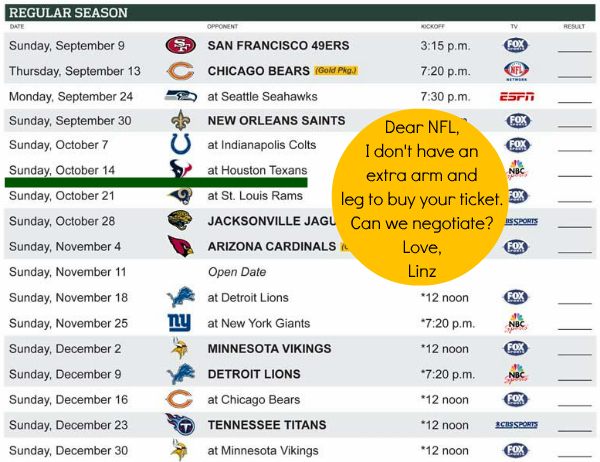 NFL stands for No Football for Lindsay. After Mr. TBS found out that the Packers were playing in Houston next season, we planned to buy tickets to the game. I was really excited to finally go to an NFL game! 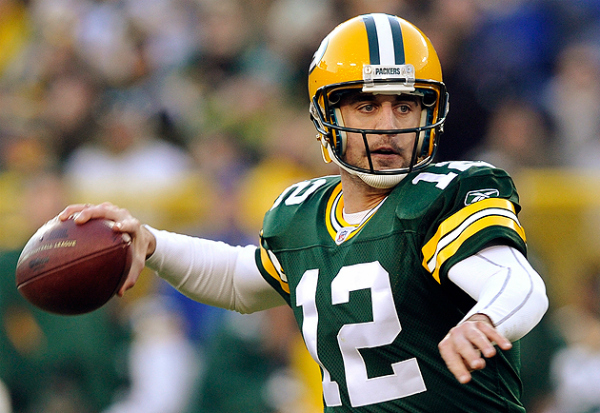 I want to see Aaron Rodgers play. But alas, the realism of supply and demand made itself known yesterday, and there is just no way we can pay $400 for a few hours of live sports from fairly decent seats. $400 plus parking, plus food?! NFL, you're killing me. After the initial sticker shock, it made sense to him since the Texans and Packers had a good season, but it has become very apparent to me that you have to be loaded, the best friend of someone loaded, or crazy enough to spend that much money on 3.5 hours of fun. If we plan on taking an international trip next year (and possibly buying a nice camera... maybe? ), those $400+ will be needed. I choose the trip. So on Sunday, October 14, I know where I'll be. At home. Still with no NFL games under my belt. Anyway, if we ever spend that kind of money on a game, it's going to be at Lambeau Field! Side note: When did I become the girl who blogged about sports? That is SO much money. So so much. So much I can barely believe it. Where do people get the money to be season ticket holders?! My mind has been all sorts of blown. Ummmm, October 14th can we have a football watching party? I'm a Packers fan too!! I can totally see how someone would spend that much money, actually, although I agree with you that it's ALOT of money for one game. We went to the Patriots vs. Texans game a few years ago. My dad (and by extension, me) is a HUGE Pats fan and he's been trying to save enough to get to a game for years. He finally got tickets (paid a lot for them) and we got to go. He'll probably not want to spend that much again, but it was cool to help him cross something off his bucket list. On the other hand, I love watching on TV. I can make my own food, take a nap, etc. Much more relaxed! Check stub hub...you can get cheaper seats. And honestly there are NO bad seat in Reliant. I go to Texans games every year and I have sat all over that stadium and I promise that no matter where you sit the seats will be amazing. I have been to a pre-season game a couple years ago Texans VS Broncos. (GO BRONCOS!) But, I haven't been since. :( Sad. Dani has the same suggestion as me, StubHub. Except I'll add that if you wait it out and buy tickets day of, you'll more than likely find someone wanting to get rid of their tickets. J and I do this all the time, we NEVER pay more then face value. wow! $400. Unbelievable. Here in Holland people are crazy about soccer and good games will sell, but I'm not sure they sell for that amount of money. Sometimes people try and sell them last minute on craigslist! Or if anyone you know has season tickets and isn't interested in going to that game.. I know, we hold off on going to games every year because they are sooo expensive! Good luck! hhahahaha your post yesterday and now this todaY? Lindsay, I'm loving you. NFL>>> that's so cute. I'm NSA... no sports annelise! The only time that I have ever been to an NFL game was when my boss, who was the Chargers chaplain at the time, had free tickets to give away for a preseason game. I feel the same way that you do about sports. Just be thankful that our job traditionally revolves completely around sports! I get SO much slack for that! Hahah! Uggghhhh football makes me cringe!! Though I have come a long way. I can sit through part of a game now. Except my dad gets frustrated because every season he has to remind me what a first down is. And that's been all I can comprehend so far. Crazy!!! How are we to make that a family event!!?!? We'd have to sell FOUR arms and legs. :/ Hope you make it to CheeseHead land soon. My boys are Packers fans too. Since J is a huge Yankees fan, we try to catch a few games a year. But I definitely put my foot down about getting the more expensive seats. It's sad to me that live sports has gotten SO pricey. It was supposed to be that you could watch a baseball game for the price of a movie ticket...but now they start at $60+ for most games, plus parking, etc etc. Apparently NFL tickets are even more outrageous! J and I went to a Chargers game once (through his work so tix were free), but that's it.